Retrainers specialise in re-educating retired racehorses for equestrian purposes. If you’re a current racehorse owner wanting to have your horse retrained and placed in an equestrian home or if you’re an equestrian rider looking to purchase a quality retired racehorse please contact a retrainer in your area. Ajay Equestrian is a friendly, low key training facility suitable for all horse’s post racing. I have over 20 years of riding experience and endeavour to make every horse the best they can be. Show Jumping is where my heart lies, but I also train in horsemanship, dressage and eventing. All horses are taken out on pleasure rides through the state forest as well. I have sold on many OTTB's in my time training, with some going on to win the Melbourne Royal, others making the perfect best friends for pleasure riders, or competition mounts succeeding in their chosen disciplines. With lovely, new and evolving facilities, horses brought to me are exposed, prepared and ready for their future lives, whatever discipline that may be in. Welcome to Forest View Thoroughbreds. We have a small but dedicated team of experienced horse people who will assist with the re-training /sale of your horse or placement of one of our quality off the track horses. We are a self funded OTT re-programming / re-homing establishment who take pride in producing quality mounts suitable for a variety of disciplines. Each horse comes directly from the horse trainer or horse owner who can reliably supply us with background information from every horse we receive, including: soundness issues, vices, quirks, feeding and nutrition requirements etc. Once in our care, we will determine an appropriate spelling period and feeding regime, allowing the horse to fully let down before we begin our re-programming. All horses undergo a ground and ridden assessment. Our program is designed to release all the pressure they have absorbed during racing, to produce a relaxed, willing, happy, confident horse for future riding in your desired discipline. Our facilities include: Private paddocks with box and shade trees, communal paddock with shade trees, ample float parking, fenced 22m x 44m arena, round yard, hot wash, beautiful riding throughout the Bunyip Forest, only km's away from Mt. Cannibal and Tonimbuk Equestrian Facilities. I have had a lifelong passion for our beautiful off the track thoroughbreds. I first started riding my very first OTT TB at the age of 12 and he kick started my love for the thoroughbred. High school really kick started my love for training horses. I went to The Korralbyn International School because of their Equestrian Mastery Program. The mastery program consisted of lessons all day Friday in all three eventing disciplines with top level coaches such as Rebel Morrow. During high school I worked as a track rider for a trainer with a few horses and every now and then when his horses were finished racing I would then take them on and show them a different career. My biggest achievement with one of my thoroughbreds was taking him from a pretty wild OTT horse to competing at mini Prix level show jumping at some of the biggest shows in QLD. I really love the versatility of the thoroughbred and the try they give. They are amazing horses and I’m so honoured to be able to help many more thoroughbreds find their new lives. With over 25 years experience within the racing and equestrian industries, as a retrainer, track rider, and successful show jumping rider. Each horse is an individual and thus retrained accordingly and matched with the type of rider that the horse would suit. These early steps are very important in giving a loving permanent long term home to the Off The Track horse. Available to retrain, rehome and sell on for Clients. All horses situations are different and rates can be discussed individually. Services include showing, show prep, dressage training, early transition training and sales. 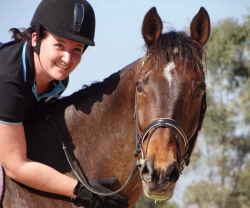 Located just 30 minutes from Melbourne, Emmandy Equestrian is operated by Emma Quigley and specialises in the retraining of quality thoroughbred horses for a range of sport riding disciplines, including eventing, show jumping and general riding club. The right start to a life after racing, giving them the best chance to unlock their full potential in any given field. Retraining Off the Track horses for every discipline. Experience and commitment second to none. Specialise in retraining retired racehorses for riding across all disciplines Each horse is an individual and is trained with this in mind, ensuring trust and respect is gained and maintained while expanding their training and discovering where their potential lies. Fiona has a passion for retraining Thoroughbreds post racing. While specialising in “Show Horses” all horses require the basic fundamentals to transition into a new career. Fiona’s re-training process is tailored to each individual horse based on their circumstances, past experience and temperament. After an initial assessment each horse has a retraining program designed and implemented to best suit that horse, to enable them to have the best possible future off the track. The possibilities are endless for this versatile breed from showing, dressage, show jumping, eventing or simply a pleasure horse. Retraining education, sales preparation and spelling services are available. The home of Sirmione & Precedence proving Top Racehorses also have a life after racing. Aims to provide Off the Track thoroughbreds with the best possible start to their life after racing by taking a holistic approach to their care and retraining. Georgie takes the time to get to know each horse’s strengths, gain their trust and respect, and retrain them to bring out their best is of utmost importance to me. I aim to find the right partnership for each horse in their most suited discipline, whether it be eventing, show jumping, dressage, show, western or pleasure. My name is Grace Chantler, and I pride myself in presenting and getting the absolute best out of every horse that comes through my gate. The horse’s welfare has always been my number one priority. I have been riding since before I can remember, and was born and raised is Western Victoria. I started in the racing industry before I finished school, trying to follow my sister’s foots steps of becoming a jockey. Sadly I just grew too tall, so I went down the path of breaking in race horses, which I absolute enjoy. Whilst still doing this I have now found myself in a position to be able to place ex race horses into suitable homes. I also pride myself in my communication, keeping previous trainers and owners updated about their horses next step in life. I've grown up with horses and have ridden for as long as I can remember. I started pony club at 7yrs old and have competed through the grades to state and national level in showjumping and eventing. I've worked in the racing industry for the last 12years and have a passion for taking on horses once they retire and retraining them to find the perfect new home to start the next phase of their life! I'm currently competing at FEI 2star level eventing with the aim to continue up the grades on my own OTT gelding who I've ridden since a yearling throughout his racing career before getting him off the track as a 4.5 year old! I also take on and enjoy working with racehorses during their current racing careers that may have difficulties and need a bit of dressage and/or jumping work or conditioning work to build up more muscle and topline. Specialising in retraining of retired racehorses for eventing, dressage, pony club, adult riding club & other sporting disciplines. Each horse undergoes individual training & management programs to cater for their particular needs & requirements. Also available for lessons/schooling & campaigning of retired racehorses. Kate has been riding, educating and training thoroughbreds for more than 20 years. She works closely with horses during all stages of their life, from breaking and pre-training, to racing and re-education for an Off the Track career, where she is a successful three-star eventer and World Cup show jumper. I have been involved in the Racing Industry my whole life. As a child I would spend all my spare time with my grandfather & Great grandfather who were trainers as is my mother – going to races helping in the stables was my first passion and the highlight of my school holidays. My first job was at a Racing Stable here in Ballarat where I started as a strapper and graduating to riding work. I have been retraining OTT’s for 18 years which has been both challenging and rewarding. Determining the appropriate path towards these horses being placed in disciplines most suited to them, getting them conditioned and working quietly and confidently ensure that they find their forever homes. Equally important is ensuring that these horses are not placed with people who do not have the capabilities to suit the particular horse, the right owner is always out there. Currently I have 2 OTT horses in work achieving great success in the show ring and I look forward to taking on more horses to educate and re-home, there is nothing more rewarding than having new owners call to say how much they love their new horses and that they are everything I promised they would be. 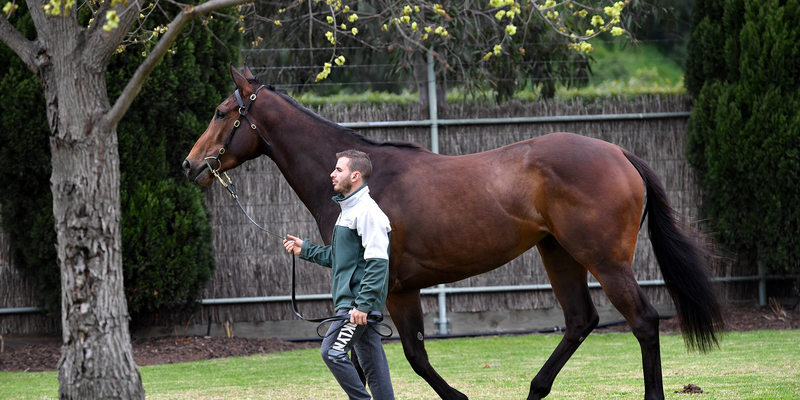 Specialise in working with owners of retired racehorses to assist with the transition of racehorse to riding horse. Retrain thoroughbreds for most disciplines, mainly showjumping where horses are suitable. Specializing in retraining off the track thoroughbreds for eventing and show jumping. With broad experience with horses in different disciplines including pony club, camp drafting, polo Crosse, eventing, show jumping, riding club and dressage. The athleticism and versatility of the Thoroughbred means that they can be suited to many pursuits. The aim as a retainer is to match the right horse with the right rider, in the right discipline. Located one-hour west of Melbourne on a beef farm. Our horses are given great exposure to farm life, stock work etc. before beginning their new career. There is a life after racing and we can't wait to facilitate it. We specialise in retraining & rehoming thoroughbreds - All horses are retrained through a specialised program to ensure they are given the best opportunity to perform in their most appropriate equestrian discipline. We are available to re-train off the track thoroughbreds specializing in off the track thoroughbred rehabilitation for Showing purposes, however we can aid in providing most OTT horses with solid foundations that can be taken forward into any discipline. We take an objective approach when selecting OTT horses; Conformation, temperament, health and overall appearance are the most important factors that will make the horse suitable for our re-training purposes. MM Equestrian Pty Ltd specialises in retraining retired racehorses for eventing, show jumping, pony club, adult riding club & whatever the horse may excel to. Time is taken to allow the horses to spell then partake in individualised training programs. Maureen is an Equine Kinesiology taping specialist and is also a professional E.A. & P.C.A coach & equestrian rider in all disciplines. Fox Equestrian 10 Years experience training, competing and homing Off the Track (OTT) horses. Main works have been around transitioning OTT horses to show careers, however many have also been transitioned into dressage, jumping, eventing, polo, trail riding and riding club careers. Fox Equestrian offers both homing and re-training services for both race trainers and the public. If you’re looking to home, looking to buy or just need help with your OTT horses please contact Fox Equestrian! Horses have always been a part of my family. Mum rode up until six weeks before I was born and I began riding when I was two years old on a cute buckskin Shetland called Ruby. Presently, I am 21 years old and the highlights of my riding career have been winning the Melbourne International Three Day Event CCIJ* and Best Performed Off the Track Thoroughbred with La Muso, as well as successfully completing the Australian International 3DE CCI2* and more recently, winning the Lakes and Craters CCI***. Recently I was also awarded Equestrian Victoria Young Eventing Rider of the Year. Based in South Gippsland, Victoria, I am a registered NCAS Level One coach and Racing Victoria recognised Racehorse Re-trainer. Around my University studies (Biomedical science at Federation Gippsland) I also own and run my own business: Off The Track Eventing. Shory Park Horses is one of the largest retraining programs in Australia, retraining and rehoming over 80 thoroughbreds per year. We specialise in producing genuinely quiet mounts for pony club, adult riders and a variety of disciplines depending on the particular horse. Each thoroughbred has a large spell to let down before commencing their new careers. As well as retraining our own Off the Tracks we also have a Sales preparation business for kids ponies through to 2* eventers. 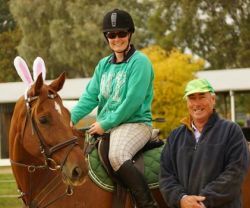 Specialise in retraining retired racehorses into top show and dressage horses competing at state levels around Australia. We are passionate about thoroughbreds. both with a lifetime of involvement with horses. We live in the high-country Mansfield Victoria – with facilities suitable for horses coming off the track to relax and unwind. We break, train and teach whilst having a small show team of horses. We also judge horses throughout Australia. Our main priority is the welfare of our horses both physically and emotionally. Once our OTT horses are let down, we begin a slow and gentle retraining process to introduce them to their new life. We find the horses let us know what discipline will suit them best, then once they are confident in their new job, we go about the process of finding the right person and home for that horse. We are very proud to be RV Acknowledged Retrainers. Train horses for all equestrian disciplines specialising in show jumping. Owned and run by Sam Gairdner and Clementine Mann, Bakers Bridge Polo runs about 100 horses and specialises in retraining ex race horses. Over the past 4 years the business has purchased or been given around 80 horses, and during the previous 10 years another 60. With the aim to sell trained horses into both the local and overseas market Bakers Bridge Polo prides itself on finding good homes for all the horses coming into its hands. Sam has played polo professionally around the world for 20 years and is now based full time in Victoria. Clementine now concentrates on training polo ponies but travelled internationally as an Eventer and has represented Australia Bakers Bridge also provides lessons, horse hire, agistment and professional playing services at its home on the Moorabool river just outside of Geelong and only 45 minutes from Melbourne’s Westgate bridge. Simon comes from a horsey family, and has turned his childhood dreams into a reality by becoming one of the most respected coaches and riders on the Victorian eventing scene. Simon, along with his wife Jessica (who have just welcomed their first daughter, Mackenzie) , run a wonderful property an hour out of Melbourne called Kia-Ora, which specializes in educating young horses and riders in dressage, cross-country and show jumping. As a qualified NCAS Equestrian Australia coach, Simon coaches statewide and interstate including coaching the for Victorian Eventing Squad riders. Kia Ora Performance Horses offers a wide range of training options for your horse. No matter what the discipline or your goals, they all require the same fundamentals. Simon spends a lot of his time competing his own team of talented eventers as well for owners. Simon currently has a Three Star Horse, Vengeance and is aiming towards competing in the 4**** competition at Adelaide Three-Day Event. A small business, ‘Red Luna Equestrian’ is run by a passionate horse woman. A PCAV coach, Steph provides lessons, further training and re-training for OTT horses and ponies. Steph loves working with thoroughbreds finding them extremely versatile and fabulous athletes. Each horse is treated individually, whether they turn their hoof at dressage, show jumping eventing or trail riding. Steph is a strong believer that setting up OTT horses with a solid foundation makes their life in their new careers a successful one. Teagan has had riding and coaching experience both within Australia and Internationally, training with world class riders including Aussie Olympian Edwina Tops Alexander. She is a member of both the Victorian Eventing and Dressage Young Rider Squads, producing horses to become versatile high-performance athletes. Luckily, OTT TB’s have a very good talent for just this which is why they are always a first option among the Zengara Park team. She has experience competing in EA Dressage, Show jumping and Eventing as well as a few seasons of Showing under her belt and Parelli Natural Horsemanship training, making her just as versatile as the horse in finding their talents. Every horse has a purpose, whether performance or leisure and the time is taken with them to find what style of training suits them best and where their forte lies. TI came to Australia from the UK backpacking approximately 7 years ago, where I soon met my now husband. In the UK I predominantly trained young horses for eventing alongside my job in London. My husband is a professional polo player and also runs his Charolais Cattle stud, cropping and sheep business. Since being here I have retrained many OTT's, mostly for our polo operation (we both play during the season) but also as allrounders, eventers etc. We are located in the stunning Grampians and I have recently had our first baby boy ‘Hugo’. It’s a very relaxing place for horses and OTT's in particular seem to thrive off it, particularly the mustering of cattle and hacking round the farm which we do, it’s all part of their training and it mentally is a great 'let down' for them after racing. We have fantastic facilities including a full-size polo field, round yard, arena, some small xc jumps and show jumps, a large exercise track (sand), good size large, well fenced paddocks, undercover yards plus spacious cattle yards. I take in all kinds of horses for schooling, to be sold, competed or just exposed to more farm life. Sophia Landy Equestrian specialises in re-training off the track thoroughbreds. Renowned for being particularly good with sensitive, touchy or difficult horses, Sophia has a great empathy with all horses which enables her to bring out the best in them. Her approach to re-training is to make the work enjoyable and straightforward for the horse, so that they can develop the attitude, skills and muscle strength needed to excel in their new post racing careers. Having competed to Grand prix level show jumping and FEI 2 Star level eventing, Sophia is an experienced competitor and has produced a number of off the track thoroughbreds to FEI level. Sophia Landy Equestrian offers re-training and campaigning of off the track thoroughbreds, with specialised programs available to suit the needs of each individual horse. Find out more information on how to become a retrainer and retrain Thoroughbred horses into new careers after their retirement.